Just wanted to take a second to inform all my fellow coffee lovers that Starbucks is giving out FREE coffee today in honor of Earth Day! How fabulous is that? I don't know about you but, I love me some FREE stuff! All you have to do is bring in your own reusable cup/tumbler. 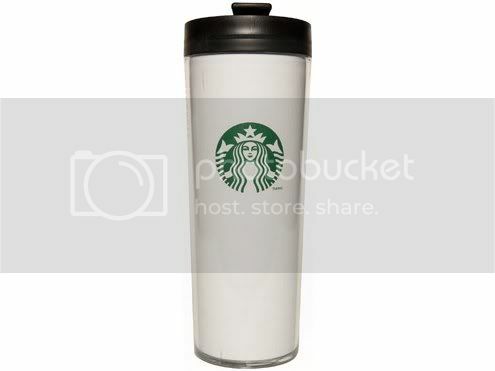 If you don't have one, Starbucks is offering 20% off on their travel mugs today. Here's a little tip - if you buy one of their mugs, you get $.10 off every refill! If you don't have a travel mug and don't want to buy one, but still want to take advantage of this fabulous freebie....just go to your local Starbucks and order your coffee "For Here" and they will pour you a nice hot cup-o-joe in a mug to drink "in-house". So...lets say you don't like coffee - (shocking!) that's ok, they'll give you tea instead. They are so kind. Happy Earth Day Everyone! Drink up! The starbucks trip was wonderful, thank you. It meant so much to me to spend my day meditating about life. This blog has inspired me.